For the first time ever, Pace University has joined forces with One Hundred Black Men of New York for the Jr. 100/Pathways to Success program. 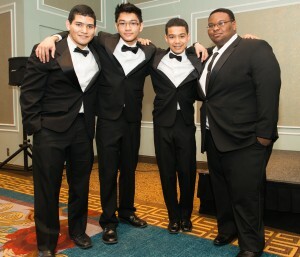 The Jr. 100 program is a world-class leadership and educational enrichment program that helps prepare High School students (such as the four students pictured below) to become intellectually sophisticated citizens with a vigor for personal growth and learning. This partnership will feature a rigorous and enriching curriculum that will not only challenge scholars academically but also help shape their perspectives on society. This new relationship between Pace and One Hundred Black Men has been spearheaded by Pace Government & Community Relations‘ assistant VP Vanessa Herman, and Seidenberg’s Associate Dean Dr. Jonathan Hill. Alongside Herman and Dr. Hill, Olga Bogomolova and Caitlin Grand have been in charge of Pace’s content for the upcoming events with Jr 100. These two women are also acting as mentors within the program, and helping them are student mentors Sabiya Bacchus (CS ’15) and Siobhan Wilmot-Dunbar (CS ’16). Sessions will be held on Saturdays, February to June, at both Pace University and TD Bank, and will include multiple interactions between Pace’s affiliated universities (Aalto U and Duoc U, for example) as well as companies and associations that are proud to join with 100 Black Men of New York. The primary objective of the program is to enhance life, leadership and team-building skills, while expanding awareness in college academia, entrepreneurship, and corporate careers. Additional sponsors for the events and partnership include Macy’s, Bloomingdales, CIA, and Estee Lauder. To keep up with the progress of Jr. 100, check out the follow social media handles for updates!